I had the pleasure of guiding Lance and Andrew from North Carolina for some smallmouth fishing on the Little Pigeon and French Broad Rivers. The fishing prior to their arrival had been great, but as luck would have it the watershed that feeds the Little Pigeon River had received just enough rain the night before their trip to discolor the river and increase the current to marginal fishing levels at best. I felt that even though the conditions were challenging I believed that they could catch some fish. They used a combination of spinnerbaits and live bait and by days end they had boated a total of eighteen smallies. Both of them were great fisherman and they fished hard to boat those fish under those less than ideal conditions. The highlight of the trip came just as the sun was going down. 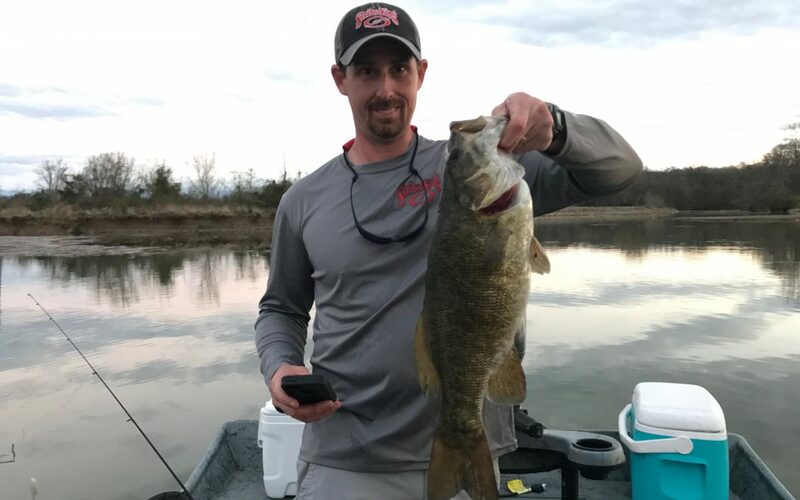 I know of a spot were the smallies move into extremely shallow water right before dark and I had the hope that they could catch some of those skinny water fish on a topwater bait. And that is exactly what happened when a large smallmouth crushed Lance’s topwater bait. Lance drove the hook home and after a tough fight the fish was finally brought to the net. It measured 21 in. long and weighed 4 lb. 6 oz. It was a fitting end to a long hard day of river smallie fishing.